"a Real Bargain Downtown Playa"
If you want MORE for LESS, this is deal is for you! Located at Calle 2 Bis, between 30th Avenue and 35th in Central Playa del Carmen this condo is for smart buyers, Less than half mile away from the beach! You could actually LIVE in this condo, because it's spacious, with more than 1,000 square foot living area, PLUS THE PRIVATE ROOF! Enjoy sunsets with martinis or make your bbq at your own charming terrace. 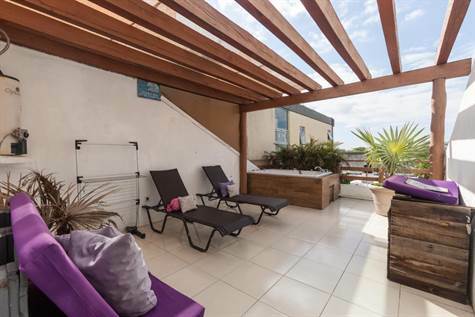 This PH for Sale in Central Playa del Carmen is advertised as a 2 Bedroom unit, but it also has an extra area at the 2nd level that now is being used as a small 3rd bedroom, but can be also a studio, office or storage. You don't have to sacrifice space or price here, this is a real bargain at only $160 dollars per square foot, often ads show balconies, parking or terraces within the "total area"
Located at the second floor, Coral Maya is a small building only 12 units, no pools, elevators or expensive amenities to maintain. It has the same price as todays 1 bedroom units in the new developments. Great for living or for renting. Everything is within walking distance and you still will feel the real Playa feeling, affordable food, Walmart, ADO bus station, you will feel like a "playense"